Improving regional foresight and Bled Forum on the future of Europe were the focus of the European Millennium Project Nodes Initiative and European Regional Foresight College Meetings held recently at the European Parliament. Technological foresight, early warning systems, security strategies, regional perspectives for 3D printing, developments in the digital economy era, potential health implications, and eventual solutions for addressing high frequency radiation and electro-magnetic radiation are some of the ideas discussed at the recent meeting of the European Regional Foresight College (ERFC) — the main foresight network in Europe — and the European Millennium Project Nodes Initiative (EuMPI). The meeting was hosted by the Belgian members of The Millennium Project and the ERFC (The Destree Institute and Technopolis). In addition to planning new initiatives in line with the EU 2020 strategy, the ERFC-EUMPI Network also helps foresight development in new Member-States. The Brussels meeting gathered around 20 representatives of the main foresight organizations from several European countries: Belgium, Croatia, Finland, France, Germany, Italy, Israel, Montenegro, Slovenia, Spain, and UK. Participants included two representatives of big European corporations with a clear social approach: Bertelsmann and MONDRAGON Corporation, through the MIK Center. “The ERFC-EUMPI Network expands futures research practice across the continent and brings innovative ideas to European foresight,” points out Ibon Zugasti, president of the European Regional Foresight College. After the delegates of the different European Millennium Project Nodes presented their current activities, the discussions focused on identifying cooperation opportunities in the field of research based on foresight methodologies, in order to define the new working priorities for the next years. They also noted that increased effort is needed to disseminate The Millennium Project`s work in Europe, including the new “2013-14 State of the Future”report. The “Foresight 2.0” program of the ERFC aims to initiate the search for innovative and creative components in a new generation of foresight. Three reviews of field experiences have been organized in 2009 and 2011, in San Sebastian (Spain) about the Gipuzkoa experience, in Genval (Belgium) about the foresight experience of Wallonia, and in Ljubljana about the foresight in the Danube region. The outcomes of these field studies were published in the “Regional Foresight 2.0 experiences” report. The next ERFC-EUMPI meeting is planned for October 2014 in France and is meant to define the new vision and strategy of the network for the coming years. 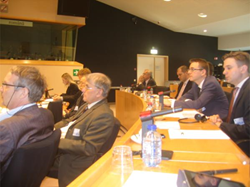 The 15th Bled Forum on the Future of Europe was held at the European Parliament, on March 25, 2014. Blaž Golob, Chairman of the Forum on Europe presented the two key themes of this year’s meeting: “How to implement European strategies more effectively?” and “Does the European Union need a development vision?” The Declaration adopted emphasizes that foresight approach should be used on regular basis in policy-making, and good governance models incorporated in the decision-making processes; e-participation should be further encouraged and developed; EU member states should include macroregional strategies and priority projects into Partnership agreements and Operational programs; EU 2014-2020 urban policy should emphasize and support the role of CORE cities as key promoters of sustainable development; and industry solutions should be used to support development strategies and for building various partnerships, such as Public – Private – NGO – University. The European Regional Foresight College has been founded on April 1, 2004, thanks to the initiative of the Land Planning and Regional Action Delegation of the French Republic (DATAR). The global objectives of the European Regional Foresight College are to create a community of competencies, concepts, methods and practices in regional foresight, to organize a European network in order to monitor and to discuss foresight practices and developments in European regions, and to contribute to the collective learning of all regional actors through the development of foresight competencies, by providing all partners with information about high-level European foresight experiences. The first years of the ERFC were dedicated to the drawing up of a foresight glossary. It has, since its foundation, organized a dozen of seminars in Paris, three residential seminars in Etiolles (Evry) and contributed to two Foresight Summer Universities in Lille. Since 2009, the European Regional Foresight College has adopted the legal status of an NGO. The EuMPI has been created in order to structure networking between European Future Knowledge centers participating as “Nodes” of The Millennium Project. It was officially launched in November 2003 at the European Parliament, Brussels. The Millennium Project is a global think-tank founded in 1996 with international participation which produces the annual State of the Future reports, the Futures Research Methodology series, the Global Futures Intelligence System (GFIS) with related software, and specialized studies. The Millennium Project has 50 Nodes worldwide, which identify participants, translate questionnaires and reports, and carry out special research, workshops, symposiums and interviews to promote advanced training. The mission of the Millennium Project is to improve the humanity’s future and make this knowledge available through a variety of feedback mechanisms, with the objective of accumulating knowledge about the future in order to make better decisions in the present.